If you’re looking for a great way to start saving money right now that will net you over $1300 in 1 year, we’ve put together an easy system which offers a good amount of flexibility to give you the greatest chance of success. This is a hybrid of the original 52-week money challenge putting more control in your hands to deal with the inevitable financial challenges which come with daily life. In a lot of ways, the 52 Week Money Challenge is similar to a game of Yahtzee. There are 52 weeks in the year with a dollar amount corresponding to all 52 weeks. Each week your goal is to try to save the highest amount that is still available from the bottom numbers. While the highest dollar amount is the goal, there will certainly be weeks when you aren’t able to save the full amount. Whatever amount you are able to save each week, that is the number that you write and then cross that number off the bottom. Click image to enlarge or print here (pdf)Your goal for the first week is to save $52, but even if you aren’t able to reach that amount, you haven’t failed. In this way, it is similar to Yahtzee. Whenever you roll the dice, your ultimate goal is to try to get a Yahtzee, but depending on how things are going with the rolls, you attempt to get the best number you can from the still open hands on your card. In this challenge, you’re doing the same thing, but just with the dollar amounts, you’re able to save each week. For example, say that you are able to save $42 the first week you begin the challenge. You would X out the $42 at the bottom of the chart and place it in the deposit line for week one and that would also be your balance since it is the first week. In week two you are able to save $18. You X out the $18 at the bottom of the chart and place $18 in the deposit line. You then would place $60 as the balance ($42 + $18) for week two. In week three you’re able to save $52 which you cross off, add and come away with a balance of $112. In week four, you have a tough week and are only able to save a single dollar. You cross it off, deposit the $1 and up your balance to $113. 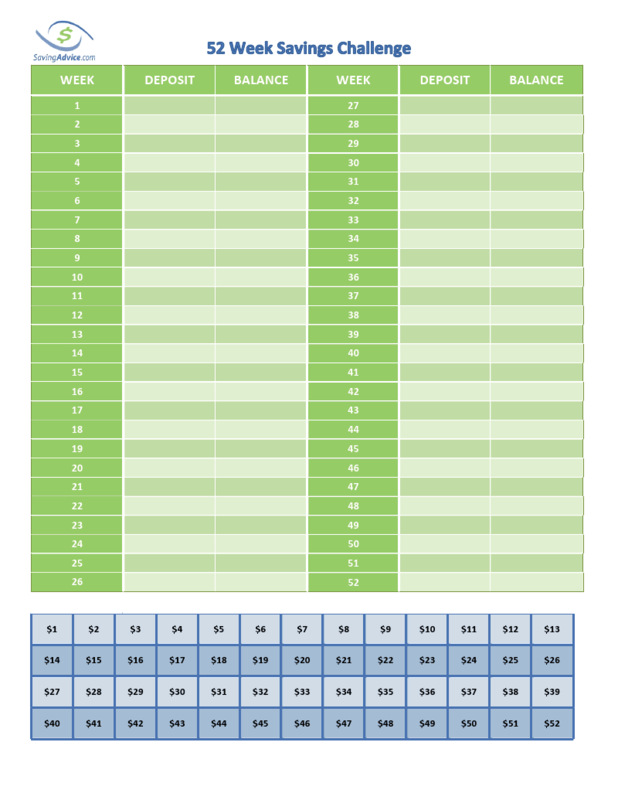 Because you choose the amount to save each week in relation to your finances (always with the goal to try to save the top dollar amount still available at the bottom of the chart), you don’t fail the challenge just because you have a few rough weeks where you aren’t able to save a lot of money. We all have good weeks and we all have bad weeks and they don’t come about uniformly. By trying to save the most you can each week which takes into account the financial realities of that week, it gives you much-needed flexibility and a better chance of success compared to having a set dollar amount you must save each week that corresponds to that specific week. Another advantage is that there is no need to begin this challenge at the beginning of the year, but you can start at any time. Week one is the first week you begin (as opposed to the first week of the calendar year). That means that if you come across this challenge in the summer, there is no need to wait half a year to begin. You can start today. Simply designate one day of the week when you will make the deposit and you are ready to go for an entire year from that point. The most important aspect of this challenge is that you simply begin doing it. Even if the first few weeks your saving amount is low, you are getting yourself into the habit of saving. As you become comfortable with that habit, you should find more ways to save that will help you knock off those bigger numbers always knowing that you have some small numbers there as well if finances get tight some weeks. Once in the habit, you may find it easy to save even more. There are also now kids versions of this challenge which replace the dollar amount with quarters, dimes, nickels or pennies depending on how old your child is and the amount that he wants to save. 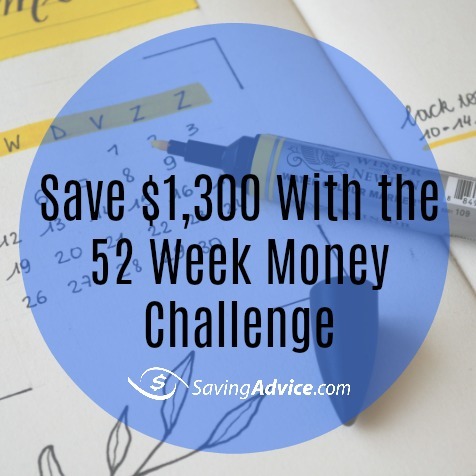 Print the 52 Week Money Challenge by clicking here. Before you get started, also check out the 52 Week Money Challenge forum group where you can share how your challenge is going with others and both receive and provide support for others participating in the challenge. Click image to enlarge or print here (pdf)If you’re looking for a great way to start saving money right now that will net you over $1300 in 1 year, we’ve put together an easy system which offers a good amount of flexibility to give you the greatest chance of success. This is a hybrid of the original 52 week money challenge putting more control in your hands to deal with the inevitable financial challenges which come with daily life. In a lot of ways, the 52 Week Savings Challenge is similar to a game of Yahtzee. There are 52 weeks in the year with a dollar amount corresponding to all 52 weeks. Each week your goal is to try to save the highest amount that is still available from the bottom numbers. While the highest dollar amount is the goal, there will certainly be weeks when you aren’t able to save the full amount. Whatever amount you are able to save each week, that is the number that you write and then cross that number off the bottom. Your goal for the first week is to save $52, but even if you aren’t able to reach that amount, you haven’t failed. In this way it is similar to Yahtzee. Whenever you roll the dice, you ultimate goal is to try to get a Yahtzee, but depending on how things are going with the rolls, you attempt to get the best number you can from the still open hands on your card. In this challenge you’re doing the same thing, but just with the dollar amounts you’re able to save each week. 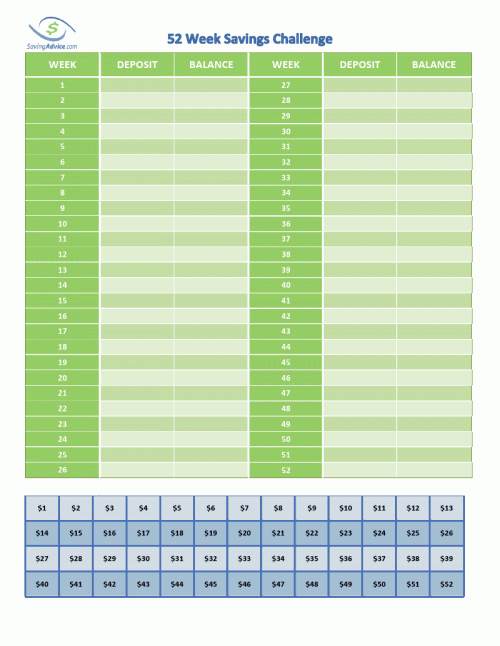 Because you choose the amount to save each week in relation to your finances (always with the goal to try to save the top dollar amount still available at the bottom of the chart), you don’t fail the challenge just because you have a few rough weeks where you aren’t able to save a lot of money. We all have good weeks and we all have bad weeks and they don’t come about uniformly. By trying to save the most you can each week which takes into account the financial realities of that week, it gives you much needed flexibility and a better chance of success compared to having a set dollar amount you must save each week that corresponds to that specific week. Another advantage is that there is no need to begin this challenge at the beginning of the year, but you can start at any time. Week one is the first week you begin (as opposed to the first week of the calendar year). That means that if you come across this challenge in the summer, there is not need to wait half a year to begin. You can start today. Simply designate one day of the week when you will make the deposit and you are ready to go for an entire year from that point. The most important aspect of this challenge is that you simply begin doing it. Even if the first few weeks your saving amount is low, you are getting yourself into the habit of saving. As you become comfortable with that habit, you should find more ways to save that will help you knock off those bigger numbers always knowing that you have some small numbers there as well if finances get tight some weeks. Once in the habit you may find it easy to save even more. You can print the challenge sheet by clicking here (pdf). I encourage you to give it a try, and I would love to hear any feedback you have about it. If you are looking for support as you do this challenge, join the forum group where you can share how your challenge is going with others. There are also now kids versions of this challenge which replace the dollar amount with quarters, dimes, nickels or pennies depending on how old your child is and the amount that he wants to save. The 52 week savings challenge is the active approach to savings. Its active because you need to manage both the amount you save and when you make deposits. This can be really excellent if you are highly motivated. But what if you are busy, but still want to save? The answer is go with a passive savings approach using an app like digit.co. Digit is one of a family of savings applications which has emerged in recent years. Pretty much what digit does is you activate the software, then allow it to access your checking account. The software determines how much can safely be withdrawn, then it sweeps that amount into a savings account you control. It is super easy to sign up. Check it out here.